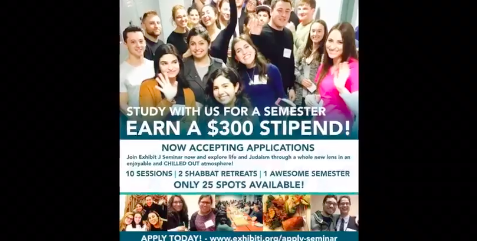 Available for Young Jewish Adults on Staten Island. We’re NOW ACCEPTING APPLICATIONS for Spring semester. WANT to make $300, Eat DELICIOUS FOOD and engage your mind in STIMULATING discussions? Join the Exhibit J program (10 sessions, starting February 25th) NOW and explore life and Judaism through a whole new lens in an enjoyable and CHILLED OUT atmosphere.